“----- பேயார்க்கும் அடியேன்” (Paiyarkkum adiyen) With these words Sundaramurthy Nayanar paid homage to Karaikkal Ammaiyar in Thiruthondathogai. Why he referred to her as “Paiyar” we shall see briefly in this blog. In fact she herself had signed in some of her songs as “ghost of Karaikkal” as can be seen in the following song in Thiru Alangattu Mootha Thiruppathikam. To the unequalled gruesome ghosts beating one another and shouting together, the birds (in the cremation ground) singing, fox making the sound of the string instrument, yazh, the Lord dances at Thiru Aalankadu. On that Lord, whoever sings these ten songs said by the ghost of Karaikkal, they would get Sivagathi and enjoy the bliss. Karaikal Ammaiyar is one of three women among 63 Nayanmars, the other two being Mangayarkarasiyar and Isai jnaniyar. Her original name is Punithavathy and she was born in Karaikal in a rich business family. Even from childhood she was greatly devoted to worship of Lord Siva and attended to devotees of Lord Siva, reverentially. As she grew to a marriageable age she was married to the son of a rich merchant in Nagapattinam, named Paramadattan. Her father settled them in Karaikal itself setting up a business for him and they prospered. Punithavathy while being a devoted wife, continued her devoted services to Lord through worship and service to devotees of Lord Siva, who came to her in need, with food, clothing and money, as per their needs. One day some people, who came to Paramadattan, gave him two mangoes. After receiving it, he asked them to leave them in his house. Punithavathy received them and kept them safely to serve Paramadattan in the meal-time. At that time a devotee of Siva came seeking Bhiksha. As she had nothing else to offer she gave him one of the mangoes as Bhiksha. When Paramadattan came for lunch, along with food she served him the other mango. He found it delicious and asked for the other mango as well. She went inside and prayed to Lord to save her from the predicament and as she prayed she found a mango in her open hand. She knew immediately that only through Lord’s Grace, it had appeared in her hand. Thanking the Lord profusely she took it to her husband. When Paramadattan ate it he found it far more delicious than anything he had eaten at any time. He asked his wife whether it is the same mango he had sent home. Now she could not tell him all that happened because he would not believe her and she could not also utter a falsehood. As she hesitated, he pressed again for an answer. This time she told him what happened. He could not accept that this mango had come through Lord’s Grace and asked her to validate her statement by getting another such mango from the Lord. She went inside and pleaded to the Lord to convince her husband who did not believe her. Then another mango same as the earlier one appeared in her hand. 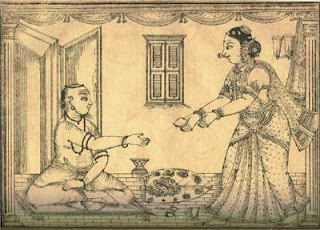 When Paramadattan received it, he had a curious sensation in the hand and it disappeared. Now he believed her and also feared her. He knew that thereafter he could not look upon her as his wife, nor could he behave like her husband. So on the pretext of going abroad for trade, he left her never to return. With the money amassed in the overseas trade he returned to a city in Pandya kingdom and settled there as a trader. Soon after that he married again and got a daughter, whom he named after Punithavathy, whom he now deified as a goddess. The relatives of Punithavathy came to know about his new life in a city in Pandya Kingdom with a wife and a child. They told her about it and wanted to take her to her husband. She accompanied them to his place. When he saw them, he prostrated before Punithavathy with his wife and daughter. To her relatives who were looking at this with shock and surprise he explained that she was a divine in mortal form and that is why he has named his child after her and that he cannot look upon her now as his wife. Punithavathy was shocked to hear his words for a moment and then saw in this an opportunity to insulate herself from contact with any person. Such was the strength of her detachment that she prayed to Lord to take her beautiful body and grant her the body of a ghost which will scare other people from approaching her and leave her free to worship full time the Lord, without any hindrance or distraction. Such was the power of her prayer and worship that Lord readily acceded to her request. Immediately her charming youthful body underwent transformation to an emaciated skeletal body, without any flesh that gives the body curves and defines the shape. Her relatives were overawed at this change and they left calling her Ammaiyar after prostrating before her. She was referred to as Karaikal Ammaiyar from then onwards. She then thanked the Lord for transforming her like one of His Ganas and sang "Arpudha Thiruvandhaadhi" and "Thiru Irattai Mani Maalai". She wanted to see Lord in Kailash and started her travel there. When she reached the foot of Mt. Kailash she started walking on her hands. Parvathy Devi seeing her walking this way, asked about the Ammaiyar. Lord Siva told Parvathy Devi that Ammaiyar is the "mother" who is taking care of them and transported her to their presence and called her ‘Ammaiye” (அம்மையே). She called him “Appa” and fell at his feet. Lord asked her to name her wish and Ammaiyar replied that she wanted immortal blissful love for Him. She also wanted that she should not be born again and even if she were to be born she should be His devotee only in all births. She also requested that she should be standing at His feet and singing His praise, when He performs His dance. Lord granted her wish and asked her to join His dance at Thiru Alangadu. (now called Thiruvalangadu). Ammaiyar again prostrated and left praising Him, the same way she came, walking on her hands.